A/B Testing Tips for Your Landing Page: How To Do It Right? 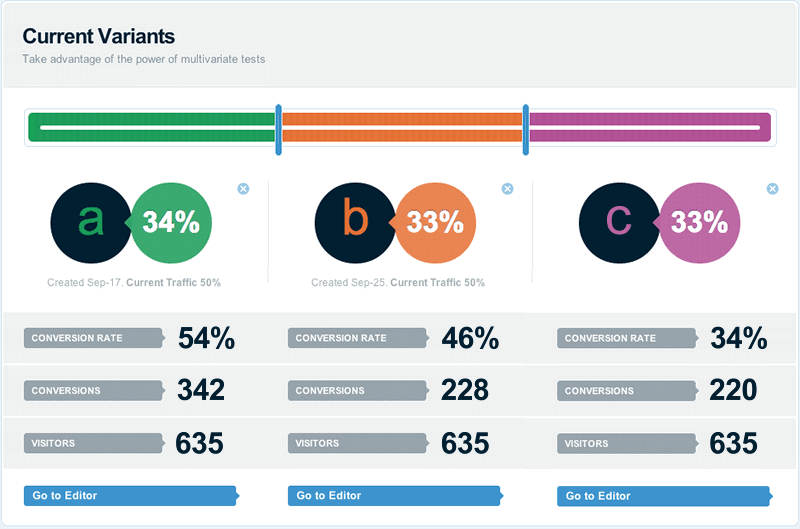 Applied to your pages, A/B testing is the disciplined application of regular testing to ensure you’ll have the best version of your Landing Page optimized for conversions. So, as you’ve read, A/B testing, or split-testing allows you to optimize your website or landing page for conversions, or in other words, the process of transforming a visitor into a customer. A/B testing offers online marketers a host of potential benefits including a lower bounce rate, higher conversion rates, and most importantly, more sales. When you conduct A/B testing, your customers and page visitors are giving you a valuable gift; they are telling you what they like and also don’t like about your online marketing efforts. The beauty of online marketing is that you can measure and improve every aspect of your strategy. It doesn’t matter if your results are “in the tank” or your campaigns are soaring sky high. You can improve them if you conduct A/B tests consistently and if you implement new changes accordingly. Most people in the marketing world never test. Unfortunately, it’s usually because they fear it will be too time consuming, complicated or expensive. However, If you’ll be disciplined and smart about A/B testing, you’ll gain valuable insights and enjoy more and more marketing success, while your competitors...well...just won’t. You’ll have a major advantage over your competitors that don’t conduct consistent A/B tests and you know what? It’s not hard or time consuming and it’s inexpensive to do, so learn how to do it now. If you have two or three main ideas about your new Landing Page but aren’t sure about which one to use, A/B Testing will help you decide exactly which direction to take. You’ll get insight on real data about your ideas and eliminate any assumption and guesswork. So, once you have those ideas reflected on each one of your Landing Page variants, assign equal traffic to each and find out which one wins. Ok, now that you have the winning version of your Landing Page it’s time to optimize it. Let’s say you change your written headline, your call to action button and your images all at the same time. Your conversion rate compared to the control or A page goes down, way down. But since you changed three landing page elements all at the same time, you don’t know what led to your falling conversion rate. Always test one thing per test; choose what to test and find out what version converts better. What exactly should I be testing? Even though you want to only change and split test one landing page element at a time, don’t limit yourself when you are choosing which elements to test. You can test almost anything: Headline, Sub Headlines, Calls to Action, Colors,Testimonials, Images, Videos, Lenght, structure even different kinds of content. How long should I run my A/B tests? Don’t run your A/B test for too short a time period or for too long either. If you test for too short a time period, your results may be a statistical anomaly and may not accurately tell you the changes that need to be made to improve your results. Test for too long and you won’t begin implementing changes soon enough, delaying the necessary improvement you are looking for. Want to start discovering the unknown problems on your Landing Page? We’ve got the perfect tool to start optimizing your Landing Page’s conversion rate! So, if your Landing Page is not getting the results you’ve imagined, and your boss is asking you for more leads from it, then A/B testing is here to help you. Remember, if you’re not testing your landing pages, they are not getting any better either. Base your editing decisions on real-time split-test feedback instead of guesswork. So, by using Lander’s powerful editor, making those changes and split testing will be so incredibly easy, you won’t have any excuses to not start testing! Simply drag and drop the elements you want to test, save your changes and let the A/B tests begin. Use this opportunity to impress your colleagues and executive team with real results, and become a conversion hero in your office! ARE YOU READY TO START A/B TESTING?